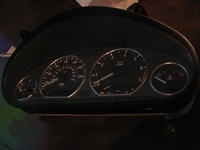 Installing Silver Gauge Cluster Rings for your BMW . . . DIY! Let me start this post by welcoming our new friend Denise Wright. As you may know I’ve been trying to make a group of BMW E36 enthusiasts from the readers of this blog. 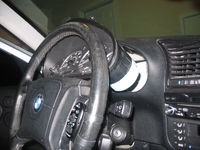 I have posted a previous topic Welcome BMW E36 blog readers! in which I asked everyone who reads this blog to write a little bit about him/her self. So if you didn’t read this post yet please do and lets hear from you. I feel really happy when I hear from you guys. OK, now for the post of today that I know most of you will like very much. 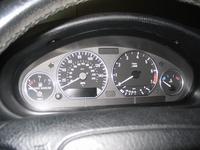 This is a DIY (do it yourself) post which will teach you how to install those cute silver gauge cluster rings on your BMW. 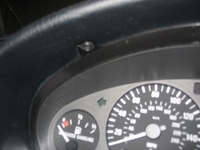 I really love the way the gauges look after the installation. I also love this DIY as it’s very simple and can be done by almost anyone who doesn’t have any experience in cars. Let not forget to thank Komodo who wrote this great DIY. Enjoy the post and lets see how things go with you. eBay for about $30-35. Here is an after stock photo of how this mod changes your car. It’s a simple mod, but makes a big difference. 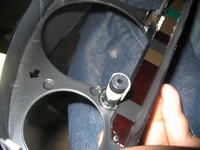 Unscrew those screws and push on the bottom of the glass to loosen the unit. Mine was stuck in there pretty good, so it took a good amount of pressure and jiggling to break it free. 2) It should now slide forward and up to the steering wheel. IMPORTANT: At this point you’re about to begin messing with electrical parts, so please stop and disconnect your battery before continuing. Leaving it plugged in might make you physically unable to finish this DIY. When you reach behind the unit, you’ll feel three wire bundles connecting it to the car. Two are on the right (one big vertical one, and one small horizontal one just below it), and one big vertical plug is on the left. Then after it’s free just slide it out beside the wheel (again, might require a bit of creative shaking and squeezing, but it’s easily possible. 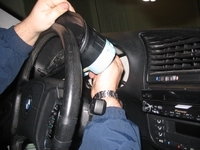 3) Now you should have the unit out of the car. Bring it inside or somewhere with good light and go get your T10 torque screw driver. 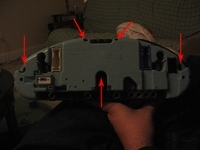 There’s 5 screws, as shown by this image of the back of the cluster. Two up top, one on each side, and one deep screw in the very middle. Now simply take your rings and pop them on to the left part of the above picture. Mine were very tight and clipped on, the friction plenty to hold them on through anything, however I know some of the rings are a lot looser and might require some creative glueing to get them to stay. Here’s a picture of the rings on just that piece. 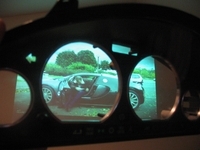 Notice the Bugatti Veyron Top Gear on the projector in the background. This is a must for this DIY. If you don’t watch Top Gear while installing the rings, they won’t work. 6) Now the reverse install. 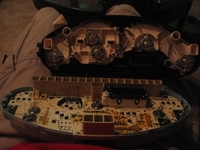 Put the faceplate back in the glass (re-screwing the three thumb screws all the way to ensure nothing moves), then using the torque screws, reattach the back half of the gauge cluster. Take it back to your car then, slide it beside the steering wheel, push it firmly into it’s hole, and screw the top two screws in. 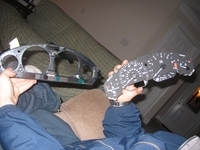 Congratulations, you now have silver gauge rings installed in your car.